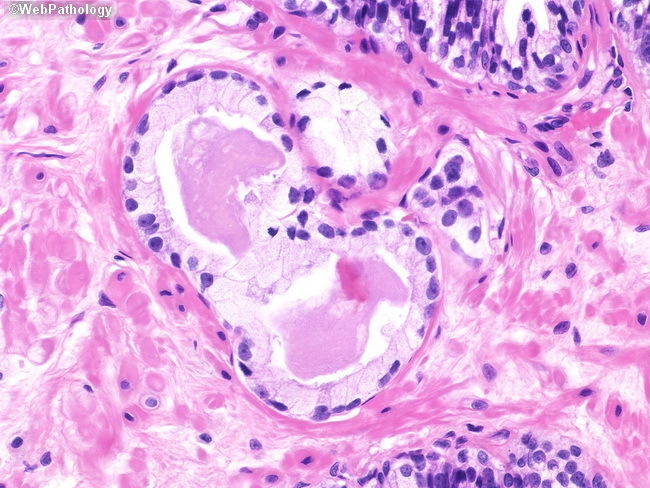 This biopsy shows a focus of 3 atypical glands with simplified lumens, enlarged nuclei, and prominent nucleoli. Basal cells were not present and there was apical immunoreactivity for AMACR with PIN4 cocktail (CK5/14, p63, AMACR). Qualitatively, the findings are those of adenocarcinoma; however, a definitive diagnosis of malignancy was not rendered due to the limited number of glands available for evaluation.